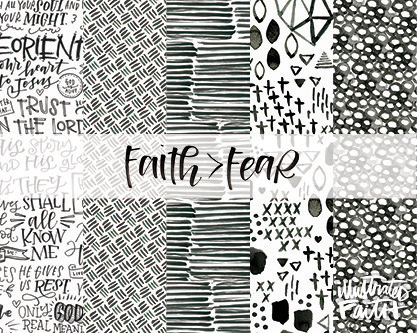 Amongst the crazy day-to-day, it’s as simple as black and white: always let your faith be bigger than your fear! Illustrated Faith has partnered with Amanda Arneill for this stunning collection! Amanda is inspiring people around the world with her beautiful hand lettering. Discover messages of His amazing grace and abounding faith throughout the patterns. Let us join with Shanna and Amanda in bringing glory to the Father on a daily basis through their influence. What a gift to share with the Illustrated Faith community!